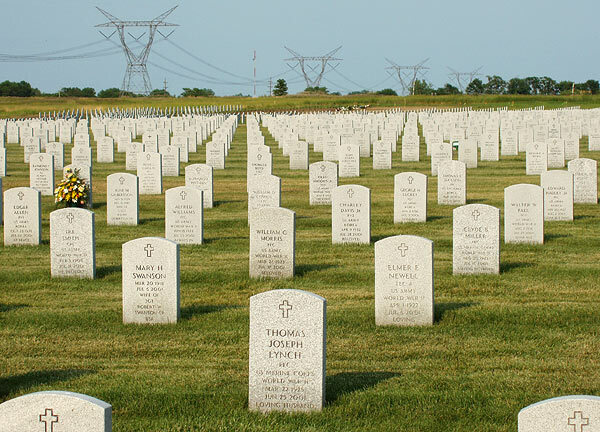 Abraham Lincoln National Cemetery is located 50 Miles south of Chicago at the south edge of Elwood, IL, on the northwest side of Route 66. Though I more often seek the environs of Celtic crosses and Victorian angels, the stoic geometry of the national cemeteries evokes a certain placid dignity. I think of an sleeping army - thousands of soldiers waiting underground. The 982 acre cemetery is a relatively recent addition to the landscape and to Route 66. It was dedicated in 1999 and sits on the former Joliet, IL Army Ammunition Plant site, also called the Joliet Arsenal. According to their website, 13,497 were interred here as of sometime in 2006. 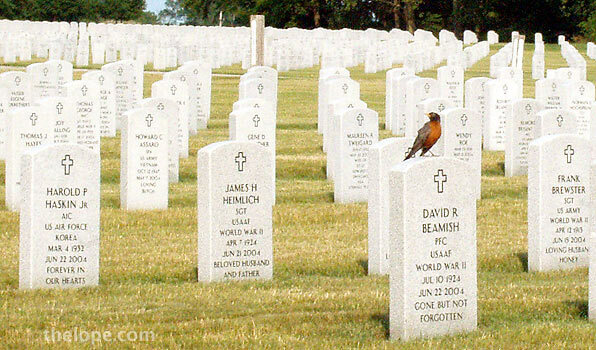 We were virtually alone in the cemetery that day last July, the only sounds being the wind and the occasional bird. 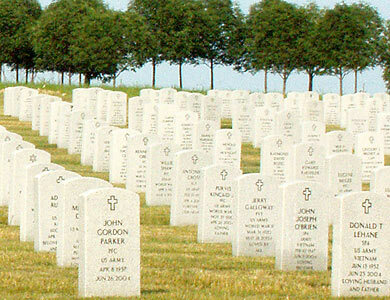 Anyone who has a loved one buried here and hopes it is a peaceful place should take comfort in that this Memorial Day. 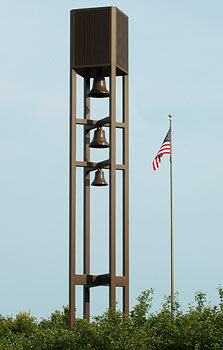 These electronically controlled chimes played patriotic tunes every so often. Abraham Lincoln founded the National Cemetery system in 1862 in response to a need to deal with casualties of the Civil War. In 1870, landscape architect Frederick Law Olmsted acted as a consultant regarding the appearance of national cemeteries. He suggested they be "studiously simple...the main object should be to establish permanent dignity and tranquility - a sacred grove - sacredness being expressed in the enclosing wall and in the perfect tranquility of the trees within." I'm not sure what Olmsted would have thought of the power lines. For more about Illinois, see He Belongs to the Ages (but you can still buy a souvenir), and The Beginning of Route 66.